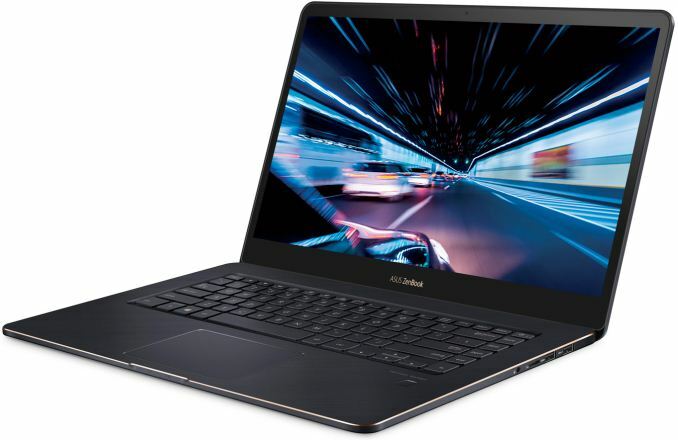 ASUS has introduced a new version of its ultra-thin 15.6-inch ZenBook Po 15 laptop that offers higher performance than predecessors while retaining a very thin z-height as well as a rather low weight. The notebook features Intel’s latest 8th Generation Core processors with six cores as well as a standalone GPU, a rare combination found in an 18.9-mm thick laptop. To make the PC even more unique, ASUS offers it with a factory-calibrated monitor. 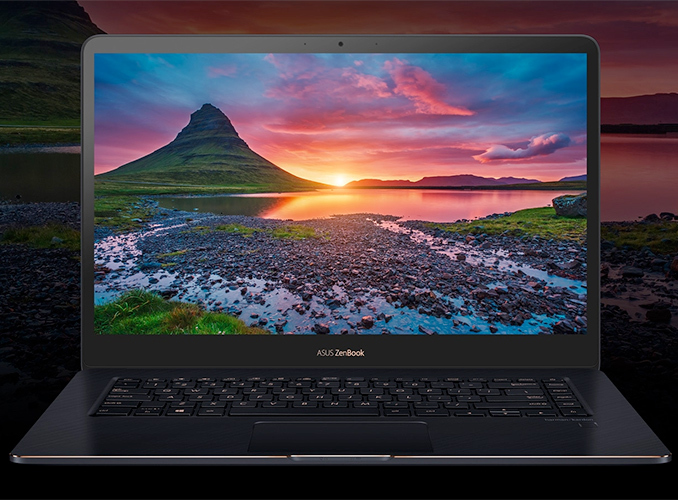 The new ASUS ZenBook Pro 15 UX550GD comes in ‘Deep Dive Blue’ aluminum unibody with rose gold edges to emphasizes its premium nature and positioning. 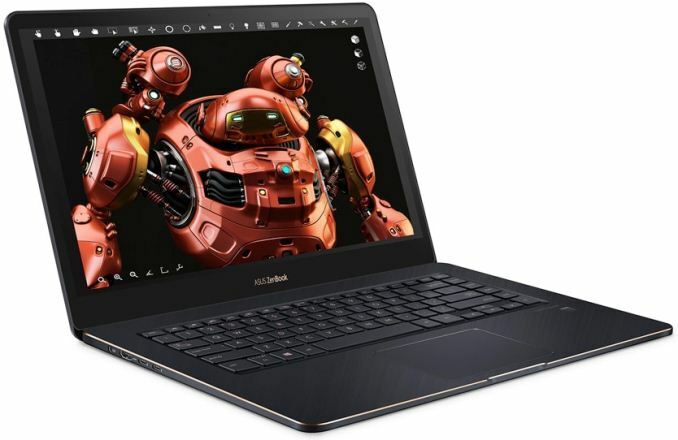 The top-of-the-range model is based on Intel’s unlocked six-core Core i9-8950HK processor, though it is unclear whether ASUS lets owners of the notebook overclock this chip. Other SKUs are powered by the six-core Core i7-8750H or the quad-core Core i5-8300H processors. The CPU is accompanied by NVIDIA’s discrete GeForce GTX 1050 graphics processor with 4 GB of GDDR5 memory, 8 or 16 GB of DDR4-2400 DRAM, and an SSD with up 1 TB capacity (PCIe 3.0 x4/NVMe). 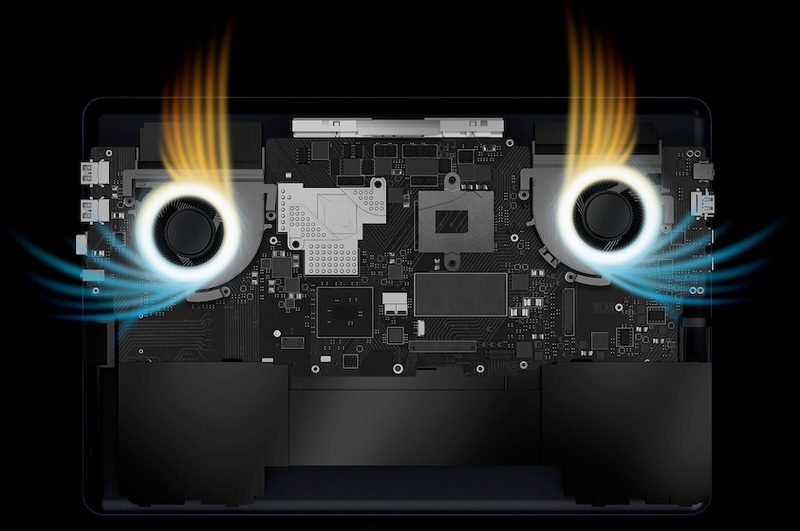 To cool the CPU and the GPU down, ASUS uses a special cooling system featuring three heat pipes and two fans. High-performance internals and a luxurious chassis are not the only first-class features offered by the ZenBook Pro 15 UX550GD. The manufacturer offers two premium 15.6-inch IPS multi-touch LCD options with the machine. One of the display panels has a 4K Ultra HD (3840×2160) resolution, covers 100% of the AdobeRGB as well as 95% of the NTSC color spaces, and is factory-calibrated to DeltaE ≤ 2 accuracy. Another option features a Full HD (1920×1080) resolution, covers 100% of the sRGB color space, and is factory-calibrated to DeltaE ≤ 3 accuracy. Not a lot of Windows-based laptops are outfitted with AdobeRGB-capable displays and even fewer come with pre-calibrated LCDs, so ASUS clearly deserves praise here. On the wireless side of things, we see Intel’s Wireless-AC 9560 CNVi solution featuring 802.11ac Wi-Fi (with up to 1.73 Gbps throughput) and Bluetooth 5.0. As for physical connectors, the notebook is equipped with two Thunderbolt 3 ports, two USB 3.1 Gen 2 headers, an HDMI display output, a microSD card reader, a TRRS audio jack, and a proprietary jack for charging. When it comes to conferencing, the laptop has a VGA webcam, Harman Kardon-badged stereo speakers, and a microphone array. Just like other ZenBook Pro 15 models, the UX550GD features an 18.9-mm z-height and weighs 1.86 kilograms, thus being thinner and lighter than most 15.6-inch laptops. To retain portability, ASUS equipped the notebook with a 71 Wh Li-Poly battery that enables it to work for up to 9.5-hours on one charge (according to MobileMark 2014), which is below what one might expect from a premium PC. Keeping in mind that there is always a tradeoff between weight, display quality, and battery life on new higher-end notebooks, the relatively limited battery life of the US550GD is not really surprising and will not scare people off who need to have a good display on a 15.6-inch laptop that is barely thicker than many 13.3-inch models. The ASUS ZenBook Pro 15 UX550GD laptops will be available in the coming weeks. ASUS has not published prices of these notebooks, but it is logical to expect the manufacturer to charge a premium for a rather unique combination of features (an unlocked Core i9 CPU, factory-calibrated 4K display, thin-and-light form-factor, etc.). Meanwhile, a version with a Core i5 processor and a Full HD LCD will likely be offered at a more democratic price. You'll probably never see USB charging on anything other than a bottom tier gaming laptop, short of some sort of kludgy dual USB plug implementation. USB power maxes out at 100W, which isn't enough unless you use a low power CPU or a very low end GPU like the MX150. 45W for the i5/i7 and 55W for the GTX 1050, only leaves 10W for the screen, ram, SSDs, fans, any USB devices, etc. That's not enough unless either the CPU or GPU is underclocked and power limited; or you're going to drain the battery while plugged in and gaming. It's a very nice-looking machine, but it's not particularly thin or light unless you compare it to lower-end machines. The Dell XPS 15 a bit thinner and lighter. The MacBook Pro is much thinner and a bit lighter. And then there are the thing/light champs like the Samsung Notebook 9 and LG Gram.